From the editorial in today’s LNP – Always Lancaster. “Open Streets Lancaster is different than a block party or street fair. It is part of a broad City effort to encourage physical activity, and help people meet, make social connections, and re-imagine the City as a place to walk and bike for transportation. Columbia Police Department facebook page … and the CPD shared the information and these folks are listed in LNP – Always Lancaster‘s POLICE LOG today. A communication step forward. This week’s inspections at Lancaster Online has a bunch of Turkey Hill stores listed again; overwhelmingly, they’re “change of owner” inspections. “Places2040 available for public review and comment | The Lancaster County Planning Commission announced today the release of the Preliminary Public Draft of places2040, the new Lancaster County comprehensive plan. The plan is available for public review and comment at https://www.places2040.com. Make our downtowns into regional hubs. (Yeah, we’ve said this before: “Central place theory is a geographical theory that seeks to explain the number, size and location of human settlements in a residential system. The theory was created by the German geographer Walter Christaller, who asserted that settlements simply functioned as ‘central places’ providing services to surrounding areas.“ Columbia should be a hub. Use existing buildings and maintain public infrastructure. Build more compactly and efficiently. “Build up, not out. Increase housing density in urban areas as a whole, but vary that density on a regional basis, based on development patterns and growth trends.” We interpret this as more multi-unit residences. Break down the traditional silos that limit our effectiveness. We interpret this as having leaders who embrace transparency and collective input. Make planning and regulation more efficient, consistent, and regional. There are too many municipalities, police departments and school districts … duplicating services. 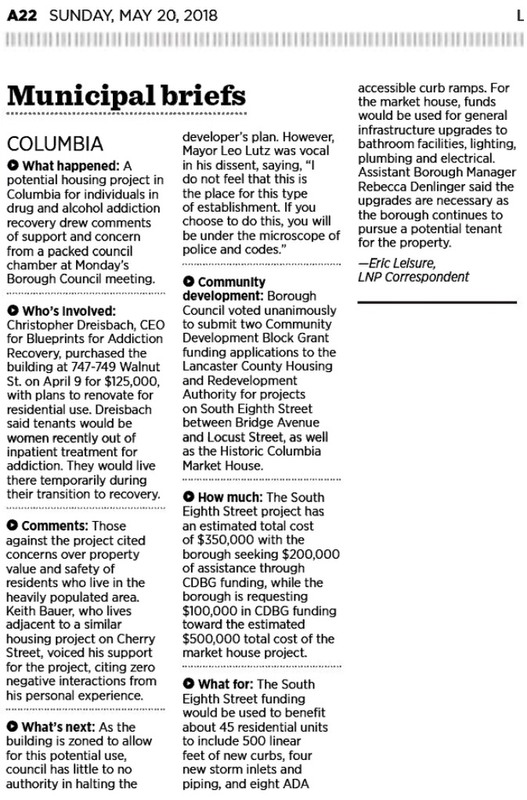 Another perspective of what happened at last Monday’s council meeting appears in today’s LNP – Always Lancaster.